With the final Spanish cycling federation (RFEC) decision possibly coming as early as today, reports in one Spanish newspaper suggest that part of the Competition Committee investigating the case want to clear him of all wrongdoing. According to El Periódico, an unspecified number of the judges examining Contador’s case are now considering giving him no sanction. If agreed by all, this would be a radical departure from the provisional ruling of a one year ban made at the end of last month. The Spanish rider tested positive on the second rest day of the 2010 Tour de France, which he won. That sample showed small traces of the banned substance Clenbuterol, as did three other samples taken over the next four days. The latter readings are almost certainly reflective of the first positive trace gradually leaving his system. Contador claims that he never knowingly consumed the substance, and that it came from tainted meat which was bought across the border in Irun and brought to the Tour. Several other members of the Astana team also ate the meat, but these were not tested. Under WADA rules, sportspeople are responsible for everything they consume, and the onus is on them to ensure that there are no banned substances contained therein. Several previous cases have led to rulings of accidental consumption, such as the tainted supplement situation proven by the swimmer Jessica Hardy. These have followed the WADA code in applying a sanction of one year, 50% of the usual ban. One exception to that is the German table tennis player Dimitrij Ovtcharov, who was cleared by his national federation after he said that he had eaten contaminated meat at the China Open. China is known to have a far higher rate of Clenbuterol use in cattle than Spain does, and so this is likely to have been a factor. So too hair tests Ovtcharov underwent, which backed up his arguments. WADA has said that it is considering appealing that ruling. As regards the Contador case, it and the UCI have stated that they will appeal any RFEC decision that they are not satisfied with. This fact is thought to be a factor that will be carefully considered today prior to the official ruling being finalised and announced. The RFEC has already contacted the UCI seeking guidance on the length of the ban it should imposed, but said that the governing body did not reply to it within a timeframe laid out by the UCI itself. Contador has also denied the hypothesis proposed by some as a more likely source of his Clenbuterol positive, namely an autologous blood transfusion. That theory would suggest that Clenbuterol was used in training and that blood was extracted before it had fully cleared the system. The hypothesis is that when it was transfused during the Tour, it caused minute traces of the substance to be reintroduced to the body, which was then detected by the Cologne anti-doping laboratory. That lab has a sensitivity which many others don’t have. Contador maintains that he has never undergone transfusions, and claims that his biological passport is flawless and supports his assertion that he did not carry out blood doping. French anti-doping expert Michael Audran has suggested otherwise, telling RMC in recent days that his personal belief is that a transfusion is the most logical source. “What I deduce is that it was contaminated, that’s certain, but probably not with meat. The thesis of blood transfusion mentioned by the media seems more viable. Traces of plasticizers were likely found in his urine which would validate this theory of a transfusion. “This remains a hypothesis, but we must not forget that when the traces were found, he had just crossed the Tourmalet and had to redo it after only two days. A blood transfusion helps a lot at that time.” It is not know if Audran has access to any supplementary information, or if he is basing his suggestion on reasoning alone. After Contador tested positive, German journalist Hans Joachim Seppelt said on an ARD television programme that Contador’s samples from the period in question contain high levels of plasticizers. The New York Times then printed a story on October 5th, citing an un-named source as stating that a urine sample taken by the UCI on July 20th revealed levels of plasticizers eight times higher than the minimum amount thought to point towards doping. 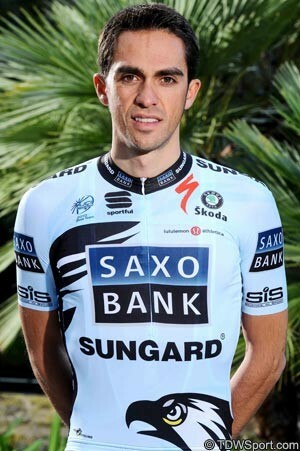 Contador denies this is the case, and there has never been an on-record confirmation by the lab, the UCI or WADA. The New York Times suggested that the high levels of plasticizers were detected the night before the positive test for Clenbuterol, rather than on the rest day itself. There is currently no approved test for autologous blood transfusions, although in December the journal Analytical and Bioanalytical Chemistry printed a study into the detection of such transfusions via the measurement of such plasticizer levels in urine. The blood bags used to store blood have this chemical added to keep them pliable, and over time traces leech out into the fluid. The test was submitted by a dozen researchers from anti-doping laboratories in Cologne, Barcelona and at the Universities of Budapest, and appeared on the journal’s website on Christmas day. Publication in a peer-reviewed journal is a major step towards the validation of methods for use under the World Anti Doping Agency code, which requires a strong standard of proof in order to stand up against challenge. Howman confirmed to VeloNation that the appearance of papers in medical journals was an important step in approving new anti-doping methods. “Publication in a peer-review journal is one of the elements that WADA takes into account in the validation of a detection methodology,” he said. “Review of the methodology by WADA's Science Committees, WADA's Science Department and external experts in the field, where relevant, as well as reproducibility by other anti-doping laboratories, can also be part of the process." He was not commenting specifically on the Contador case, but rather speaking in more general terms. El Pais quoted an unnamed source close to the scientific committee of WADA, who suggested that the push for approval could in theory be linked to Contador’s case. It is worth bearing in mind that thus far, there has been no suggestion that plasticizer levels were part of the evidence that the RFEC has been asked to consider. If that is indeed the case, Contador’s biological passport is the only way to assess if transfusions were a possible source for the Clenbuterol, or if the tainted meat story is indeed the most likely explanation for what happened. The issues should become a little more clear when the RFEC makes its final decision. Whether that comes today or not, the situation is gradually moving closer to a final resolution. The sanction handed down by the RFEC and the subsequent reactions by Contador plus the UCI/WADA will determine if the matter is settled with this ruling, or whether CAS becomes involved and it drags out even longer.